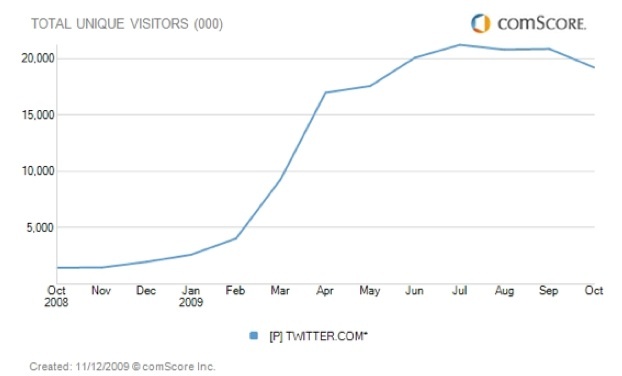 On an annual basis, Twitter is still going gangbusters with 1,271 percent growth from 1.4 million visitors in October, 2008. And on a global basis, it still seems to be chugging away with 58.4 million visitors in September. But a hypergrowth company like Twitter cannot afford to slow down in its home market. CEO Evan Williams recently acknowledged the slowdown in the U.S., and hopes that a slew of new features will help revive growth to the site. Many of these features are already rolling out, including the new Retweet button, Lists, and Geolocation features. Twitter is obviously committed to making its service better on its own Website (these numbers do not measure usage on mobile or desktop clients, which is easily half of all Twitter usage). But while it fiddles, rival Facebook keeps moving further and further ahead. Will the new features be enough to bring back growth in the U.S.? If they don’t, Twitter’s troubles will really begin.